THE humble 'Happy Hour' at a caravan park in remote WA has helped pour a staggering $100,000 into the Royal Flying Doctor Service. Tarangau Caravan Park, tucked behind the dunes at Cable Beach, has been on a charity mission to help the world-renowned "Angels of the Skies" since 2009. "The park and its guests have been long-time supporters of the service," manager Jamie Cole told Caravanning News. 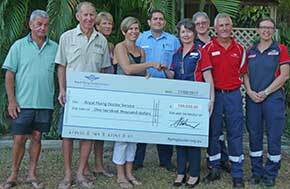 And their efforts were marked with a giant cheque being presented recently to RFDS representatives at the park. Mrs Cole said the fundraising campaign was launched by previous managers and her parents, Bevan and Lorraine Reid. "Our aim this year was to raise $15,781 to take our total funds raised to $100,000.00 and this milestone was achieved a couple of weeks ago." She said fundraising activities throughout the year included the weekly Happy Hour involving live entertainment, raffles, a sausage sizzle and the park's annual Christmas in July event. "What started as a simple Happy Hour within the caravan park back in 2009 quickly developed into a sausage sizzle as well," she said. One of the park's long-time guests suffered a heart attack while travelling north for the dry season and was flown to Perth by the RFDS for medical care. "It was after this that a decision was made to try and raise some funds for the RFDS in return," Mrs Cole explained. "During our first year we raised $2000 and were on top of the world. It has come so far since then. "Our fundraising will be ongoing notwithstanding that we have recently reached such an amazing milestone. "Our guests have always been extremely generous and supportive." Mrs Cole revealed that almost every year one of her guests or someone she knows calls the RFDS for medical care. "It is rewarding when guests stand up at Happy Hour and share their experiences with the service and thank us for our fundraising efforts," she said. "We are all too aware that we live and holiday in a fairly remote part of Western Australia. "We all appreciate the need to have access to fast, reliable and high quality medical care ... and just hope that we never have to use it."